Trump is rapidly proving himself to be the smartest president in my lifetime, perhaps in the last 100 years, perhaps ever. Thanks to Van Jones (communist) and Jay-Z (shallow thinker), with one tweet Trump brought to an otherwise misinformed public accurate data about something that’s very important. Bravo, Mr. President! Bravo! If the media covered abortion the way it does guns. A while back, Progressive women got a meme going saying that guns should be subject to the same strictures as abortion. It was, in a word, stupid, especially because it ignored entirely the Second Amendment. MRCTV came back with something much more clever: what if the media covered abortions as they cover guns? 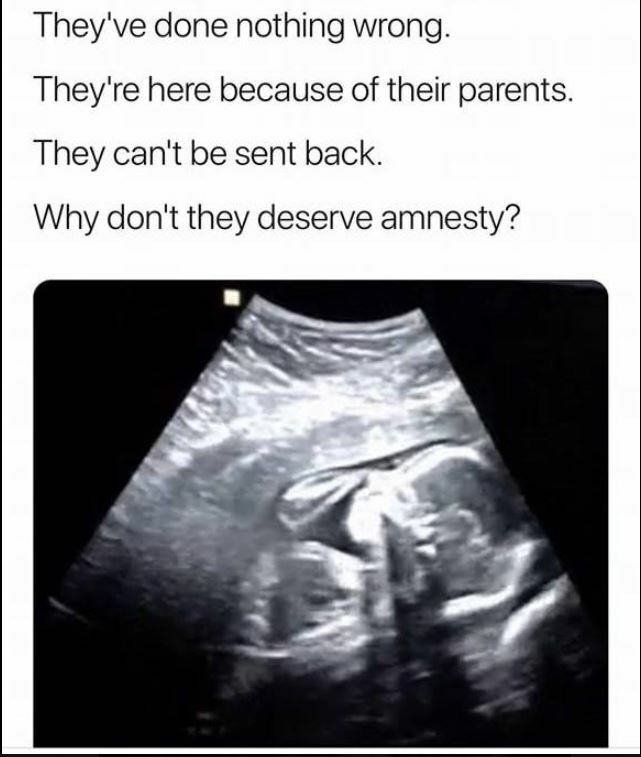 And as a bonus, what if we spoke about abortion as the media speaks about young people whose parents bring them to America illegally? Dennis Prager also realizes Trump’s genius. I love Dennis Prager. He can be a bit pedantic, but he is always wise. It is he who says “I prefer clarity to agreement,” which is a wonderful way to expose both surprise agreements and actual schisms, not to mention arguing about the real issue, not fake ones. Prager also says that, if someone says mean and stupid things, but does good and wise things, he measures them by their acts, not their words. Like Queen Elizabeth, he will not make windows into men’s souls. We are not heading for civil war; we are in a civil war. Daniel Greenfield is one of the smartest people I’ve ever met, possibly the smartest person I’ve ever met. His fund of knowledge, coupled with his unusual intellectual clarity, gives him insights into deep issues that are unparalleled and an ability to express those insights in terms people can understand. The latest example of Greenfield’s analytical genius, which every American should either watch or read, is the speech he gave in South Carolina to a Tea Party convention. Here’s the video. If you prefer reading, Greenfield has included a transcript at his site. Greenfield’s point is not that Leftists are sore losers. His point is that, not matter an election’s ostensible outcome, Leftists always win by co-opting whatever institutions are necessary to deny conservative the fruits of their victories. This has gone on for decades, but Trump’s unexpected victory has brought the battle into the open. It is a brilliant speech and an important one. Think about it: we used to get the innovators, the strivers, the hard workers, the ones yearning to make their way in the world, far from the stifling orthodoxies and laws of their home countries. Now, against our will, we find ourselves flooded with people from fundamentally socialist backgrounds who, like locusts, are looking for greener pastures to strip bare. People on my real-me have accused me of being a racist because I’m opposed to illegal immigration. My response is that I’m just as loath to take in illegal Scandinavians as I am illegal Latin Americans. I don’t like illegal immigration. More than that, I’d be deeply suspicious of taking in legal Scandinavians too, unless they can provide a record of objecting to the socialist mentality endemic in their lands. I want workers, strivers, and immigrants, not takers, regardless of race, color, creed, country of national origin, etc. Conspiracy theories are a kind of mental virus that posits a single, malevolent prime mover—Vladimir Putin, the Jews, Freemasons, Illuminati—for rationally grounded and objectively verifiable assessments of cause and effect. Societies that indulge in conspiracy theories are sick places, whose citizen-victims dwell in a kind of demented fantasyland where everything that goes wrong is the work of demons, whose existence is so obvious that very little in the way of concrete proof of their malevolent existence is needed to require the most drastic remedies. Living inside a conspiracy theorist’s head is hellish, which seems like a fair description of the effect that Glenn Simpson’s famous dossier, which FBI director James Comey called “salacious and unverified,” has had on the American public sphere. So we are to assume that in exchange for cash, Jews were helping to spy on America. Is it surprising that Russiagate would incorporate Jews into its narrative? No. There was zero chance that a conspiracy theorist like Simpson would not find a role for the Jews in his grand Trump-Russia collusion narrative. A conspiracy theory without an international cabal of un-rooted cosmopolitans exerting their influence on finance and politics in whatever society they inhabit would be like writing a symphony without a string section. You could do it, but why bother? At least one publication paid full price for orchestra seats. Read the whole thing — and then mentally congratulate Tablet Magazine, a basically Leftist Jewish publication for giving a seat at the table to Lee Smith. The time factor of energy. We know that fossil fuel saves labor. And we know that, when it comes to travel, it saves time. Indeed, in the old days, before airports became hellish time-suckers, airplanes were a fossil fuel usage that saved time on trips that could be driven in ten hours or less. Now, not so much. We don’t often think, though, about the fact that fossil fuel use, in addition to saving backbreaking labor, also saves time when it comes to household tasks. My low-energy consumption, low water usage dishwasher takes four hours to wash a load of dishes. My energy and water efficient washing machine takes over an hour to do a load of laundry. Because I have solar panels, meaning I pay extra for energy during ordinary weekday hours, I do all of my laundry on the weekends — which means that I spend all day Saturday washing and drying clothes. You know who also used to spend an entire day a week doing the family laundry? Women in a pre-industrial time, before they had washers and dryers. The labor is minimal, but the time-consumption is ridiculous.